NCP’s Dynamic reliably protects end-devices from unauthorized access and offers a wide range of features which allow for easy handling and administration. Location awareness through Friendly Net Detection, strong authentication with certificates, immediate protection of the end-device from system startup onwards and the Silent Mode are just some of these features. NCP's Net Guard (Win32/64) complements NCP's "Next Generation Network Access Technology"- the holistic Secure Communications Solution. It protects laptops, notebooks, netbooks, tablet PCs and desktop PCs with Windows 32/64 Bit operating systems - Windows 7, Windows Vista, Windows XP – from unauthorized access. The end-device is always protected against attacks, be it mobile or stationary, be it on the internet, in a Wi-Fi network or in a LAN. Depending on the location different firewall rules apply. For example, firewall rules for a public hotspot differ from firewall rules for the home office or for the corporate Wi-Fi network or LAN. On the one hand, the Net Guard offers full protection of the PC on the highest possible security level, while on the other hand it allows for a defined openness for adminis-tration purposes, for example. 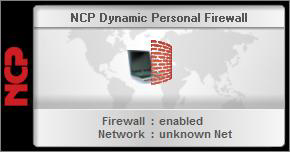 The firewall software immediately recognizes "secure" and "insecure" networks: Depending on the environment, "Friendly Net Detection" (FND) activates the respective firewall rules. In comparison to common firewall solutions, the major advantage is that a FND server, which is installed within the corporate network, authenticates itself towards the Net Guard Client (Local Awareness) and thus ensures recognition of a friendly network at any rate. Various firewall rules may be created for ports, IP addresses, segments or applications. Furthermore it is possible to define whether internet access is allowed (generally or for selected websites only) and/ or whether the corporate network may be accessed exclusively. It is possible for the administrator to lock all client settings so that the user may not alter any of them. This excludes deliberate manipulation or misconfiguration by the user. Since the NCP firewall is immediately active at system startup of the mobile or stationary end-device, this severe security gap is tightly sealed. The "Silent Mode" prevents the user from being constantly interrupted by software prompts. This default mode eliminates the most frequent source for errors – the users' frequent and doubtful confirmation of firewall prompts. 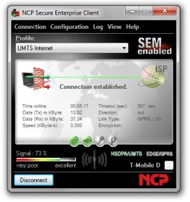 Use the Net Guard in a local network and as remote access application in connection with various VPN technologies. 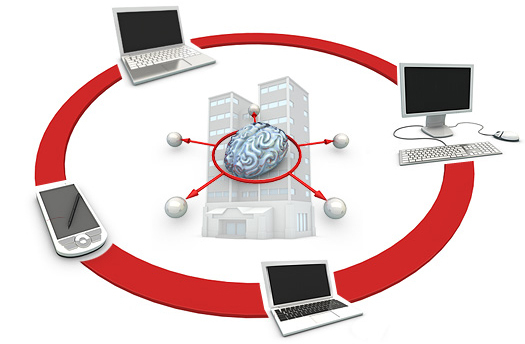 Central administration is carried out via the established NCP Secure Enterprise Management. As "Single Point of Administra-tion, the NCP Secure Enterprise Management features all functions and automatisms necessary for rollout, implementa-tion and efficient operation. All firewall settings may be defined for every single user in particular. NCP Net Guard offers increased security for the terminal device, and optimized features specifically designed for use in remote access applications. These are activated when the NCP Internet Connectors is used to establish a connection. Download the NCP Net Guard Datasheet (PDF). For more than 2,000 users, please use our Quote Request Form!